On December 10, 2016 February 17, 2018 By felicitousfelixIn Are There Lesbians? Magical Zoologist Newt Scamander arrives in 20’s New York with a case full of Magical animals. After a mix up many of them are accidentally released into a city where a new witch hunt is beginning, and the beasts are not the most dangerous thing out there. 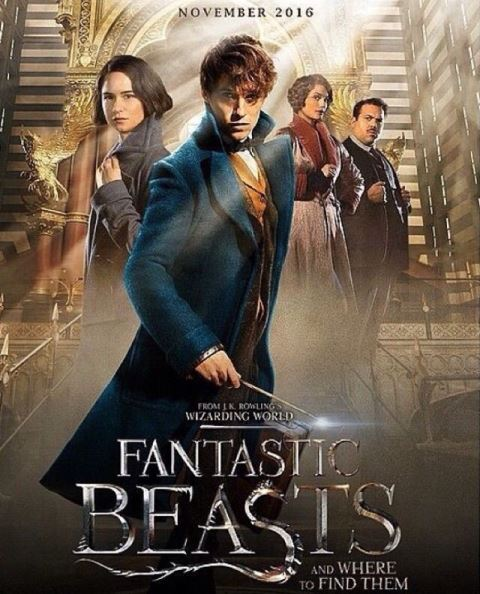 Going into Fantastic Beast and Where to Find Them I wasnt sure what to expect – I had heard it had a bit of a tone problem and from the trailers it looked a bit silly and I’ll admit, I thought the Nifflers were going to be annoying. REDACTED oh my God they are the most adorable little puggles on gods green earth and I can’t believe I ever had a bad thought against them. I want one so much and if they ever release plushie ones I will be on that so damn fast like you have no idea. Because you go into this movie practically blind, without any prior emotional attachment to the characters, I felt that Fantastic Beasts lacks the nostalgia that made the HP movies great no matter what. It thus has to work harder for its emotional response. I found that this was significantly more successful in some areas than others, particularly in the non-romantic aspects. While I loved the budding relationship between Kowalski and Queenie, I did find that the the romance between Tina and Newt felt somewhat forced. It almost felt like classic JK Rowling where she just has to pair everyone up. Granted, the plot was also somewhat predictable, and if you have paid attention to the HP books then you can see Grindelwald from a mile away. The movie also fell a little flat on the American aspects of magic. I have heard the movie has caught a lot of flack for this and as I am not American I can’t really say too much on that matter, but as an outsider even I have to admit that more thought could have been put into this as a lot of the references to “native” (or exclusively American at least) magic felt more like name dropping than properly integrated into the world. Fantastic Beasts could have just as easily been set in England without much difference being made to the plot. In general, I feel that Rowling writes rather successfully for the screen, with Fantastic Beasts feeling more similar to the Harry Potter books than some of the HP movies. I’m glad that some of the humour which permeates the book finally gets to make it into a movie as more than just a throwaway line or two. It truly helps to lighten up what would otherwise be an extremely dark movie, especially when we are not given the ending we truly want. Fantastic Beasts has many powerful female characters but does fall flat on ethnic variety. I suspected that Kowalski might at least have been Italian, you know with being a baker and the supposed importance of his grandma but alas, a brief mention of somewhere else and he’s also white. after a short discussion with The GF we unanimously decided that it would actually have given the character more depth if he hadn’t been white, especially given the era and Rowlings love of racism metaphors. Maybe they didn’t want to have a black guy as the comedic relief but somehow I doubt the casting motives were as pure as that. Seraphina Picquery, Madame President of the United Magical Congress was a delight, and quite a bit of a heart wrencher given recent circumstances. I felt this movie came for me personally in that respect. The (Jewish!) Goldstein sisters were also particularly good, flawed in their own ways but overcoming it. I particularly liked that Queenie could easily have been cast as a blonde bimbo, and yes she was a bit airy, but she is also a powerful legilamens and is perfectly able to use this against people when need be. Now, on to the part I’m sure you have all been waiting for – the Johnny Depp rant. While it is somewhat fitting for Johnny Depp to have been cast as Grindelwald, given what terrible people they both are, it’s still really hard to get past. He’s only on screen for about a minute but in that time you know it’s Johnny Depp, rather than seeing through the actor to the character. More than that, it’s once again Johnny Depp playing Johnny Depp, like he started playing Jack Sparrow and never really stopped. I made a friend the other day due to a rant about this casting choice, which is something I have Opinions about. Overall, Fantastic Beasts and Where to Find Them was a really fun movie which stands up well on it’s own. There are some areas which need work however, particularly in the expansion of this Universe to other parts of the globe, and for that reason I am kind of happy the next movies will return the story to Europe and England. Given real world events, it will be interesting to see how a series to do with the rise of a supreme race For The Greater Good will be received. P.S. I’m sure most of you are already aware of this but the original Fantastic Beast and Where to Find Them was not a novel but a bestiary of the wizarding world. In a very bizarre marketing move it has been removed from sales until sometime in the middle of next year. Only the script of the film is currently available from most places. and screwed everything up a bitbut then the real world happenedEddie Redmaynefantastic beasts and where to find themharry pottermovienewt scamanderreviewthis was supposed to be up weeks agowhere be lesbians?